Summer is the right time to make this Indonesian Recipe, raw vegetables with peanut sauce added. It is very refreshing in the summer time. And after you make this Indonesian food, don’t forget to put the dish in the refrigerator to keep the dish eatable because if you make this dish in the hot days, this dish can be sour very fast. And you can serve this oriental food for only 2 days, and after 2 days if you still have them, you have to throw it away. 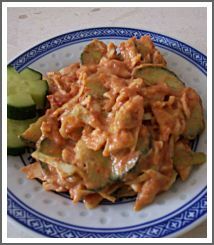 This vegetable salad or Karedok in Indonesian is very easy to make. You don’t need special skill to make it. You’re only needed the ingredients and how much you use it. If you follow the instructions and use the right spices and the herbs, I’m sure you will get this dish ready and the no doubt about the taste. I can’t tell you that this vegetable recipe is low calorie recipe because we use peanut butter which means that this Indonesian food full of calorie regardless that we use so much vegetable. But you don’t have to be scare, use less peanut butter if you want to keep this raw vegetable recipe low of calorie. 1. Make a smooth paste of garlic, aromatic galangal (kencur), Birdseye chilies and Red Chilies. Set aside. 2. Wash all the vegetables, put into the big bowl, add the mixture, peanut butter, sugar and salt. 4. If you want more spicy add more birdseye chilies. 5. Served with prawn crackers.